A friend from a micro blogging social networking site gave this link that landed on the scary reality of local celebrities getting into this bandwagon of looking like a “bisugo” (a fish characterized by a prominent pouty upper lip). If I am not mistaken, the article was entitled, “Bisugo Girls” or something. Obviously, this is a quest for beauty that has gone wrong. A lot of episodes in Oprah were dedicated to such issues. For anyone who undergoes whether facial or bodily modifications, there should be some alarm systems of sorts that will make them realize their need to stop before they end up looking like a lot of those Hollywood celebs’ crazy and scary new profiles. 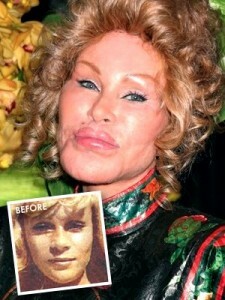 A perfect example of which is Jocelyn Wildestein, who has spent over USD 4 million on cosmetic surgery during her lifetime. More often than not, everything starts with an innocent lift. Then it gradually turns into an addiction of to look “even better”. Let us all beware ladies and gentlemen, everyone can be trapped into this false quest to beauty. I seriously wonder if it is at all true that people are given psychological tests before ever going into cosmetic surgery. If that was at all true, then why on earth are these scary faces multiplying by the day? I did an article for Spot.ph regarding this topic. I interviewed a psychiatrist, a dermatologist and a cosmetic surgeon and they said that a reputable surgeon will always always decline a patient who fails the psychiatric exam. Problem is some surgeons can be bought. After all, it isn’t their face they’re messing with!